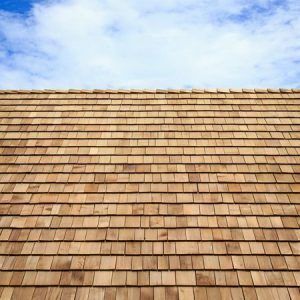 Cedar or Shingles: What’s the Better Roofing Option? Are you currently in the market for a new roof for your home? There are many different roofing options that you can choose from, but two of the most popular types are asphalt shingles and cedar shake. If you are trying to decide which of these options is the best choice for your home, let’s take a look at the advantages of each to help you make the best decision. Asphalt shingles have been used on residential homes for about a century now, and they have become one of the most common types of roofing for homeowners. Simply take a look at the homes in your neighborhood – no doubt that many feature asphalt shingles. Shingles are one of the most affordable options for roofing and are available in a variety of different styles. Easy to install, these shingles will provide your roof with the protection that it needs. As long as shingles are properly installed and fastened, they can last for two decades or longer with only minimal maintenance required. Cedar shake roofing has also become very popular for a number of reasons. Cedar is a very beautiful type of wood, which means that cedar shake roofing will serve as a decorative feature of your home once it’s installed. Cedar shake roofing is also very durable and resistant to even the worst weather and storm conditions. While cedar shake generally comes at a premium compared to asphalt shingles, it will last significantly longer and will also make your home more energy efficient, providing better insulation than other roofing options. That means you will recoup some of the initial upfront costs of installing cedar over time. Regardless of whether you opt to install shingles, cedar shake or another type of roofing option like slate, metal or rubber, Roofing by Bruce can get the job done for you. We can speak with you about the different roofing material options that might be best for your home or business and provide you with complete tear off and installation of your new roof. All of our projects are backed with our knowledge and expertise in roof installation that means you can trust the safety and protection of your roof for years to come. Call us at 570-424-7250 to schedule a roofing consultation today.